The Club | Blackhill Bounders Running Club. We are a friendly, Consett-based running club, established over 27 years ago, catering for runners of all abilities and experience. We have a growing membership (currently over 230), from those simply wishing to keep fit and socialise, to those wanting to improve their personal performances, or enter competitive races. We are affiliated to the governing body for athletics in England, England Athletics. We are also a member of County Durham Athletics Network, Club Durham, Leisureworks, and the Tony Blair Sports Foundation. We have 1 UKA Level Three Endurance Running Coach, 3 UKA Coaching Assistants and numerous Leaders in Running and Fitness (LiRF), who are all fully qualified with UK Athletics licenses, and CRB checked. Our members compete in races both on and off-road. From 1 mile, through to ultra distances. We also have men’s women’s and junior teams competing in the North East Harrier Cross Country League, which comprises of 6 league fixtures over the winter months. We are currently based at Belle Vue Leisure Centre in Consett, and the majority of our sessions will meet there. Some sessions do meet elsewhere, so please check out the calendar on the “Training” page for further information. In addition, club members will often organise other “social” runs amongst themselves when club times clash. Our main race of the year, in conjunction with the National Trust, is the “Gibside Fruitbowl Trail Race”, which is a competitive race on a hilly, 6 mile, multi-terrain course. In addition we organise an annual invitational race/social event. Throughout the year we organise away days to various races – including The Loftus Poultry Run (see above). 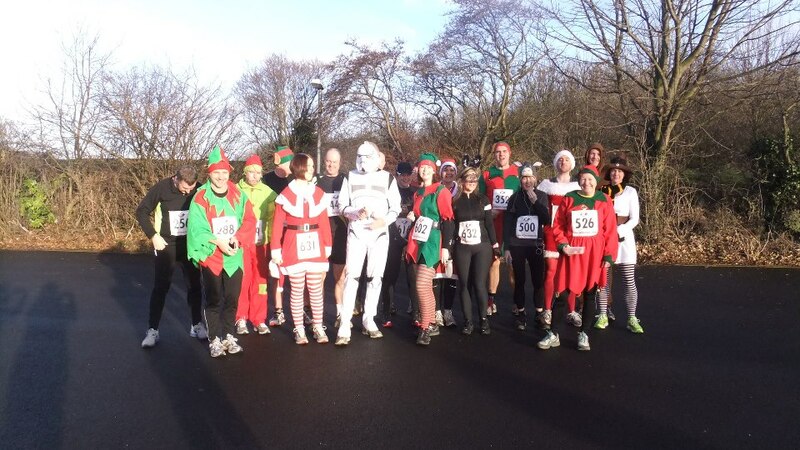 Usually ran the week before Christmas, festive fancy dress is optional! Other favourites include The Northumberland Coastal Run, Kilburn 7, Great North Run, and the Pier to Pier. These are not only great races, but great club days out, giving you the chance to socialise with fellow club members. We also organise a long distance relay over a distance of approximately 120 miles. Members can choose which/how many legs of the relay they wish to run. This event usually takes place towards the end of June, over a whole weekend, and normally finishes back in Consett. If you think you might like to join us at Blackhill Bounders, you will find more information here. Alternatively, if you’d like to find out more about Junior Bounders, then you can do so here.